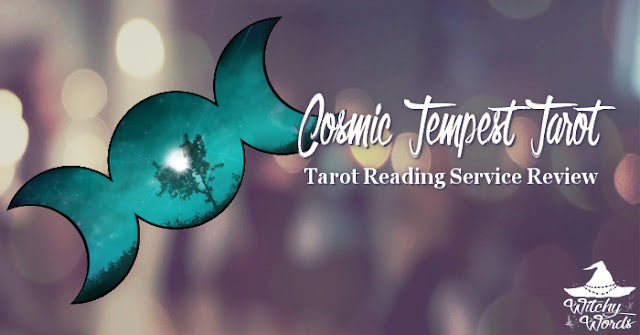 Back in July, I was contacted by Brenna, owner of Cosmic Tempest Tarot, with an offer for a reading in exchange for a review. As usual, I wanted to wait long enough to assess the accuracy of the reading along with the review. 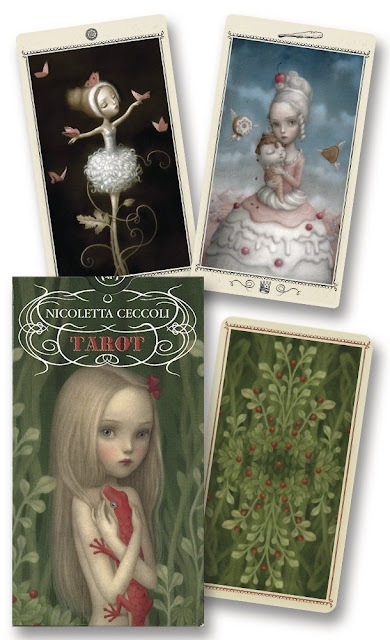 Now that we're nearing Yule, perhaps you'll consider a tarot reading for someone on your gift list! If you choose Cosmic Tempest Tarot for your reading needs, here's what to expect. Brenna began by introducing the deck she used in my reading. This particular one was the Nicoletta Ceccoli Tarot Deck, which you can find here. For my reading, Brenna drew four cards. With each card, she included a four-sentence interpretation and an image of the card for my personal evaluation. Card placement was not listed and held no significance. Instead, each of the first three cards presumably described my current situation and the final card described the "main focus" of the reading. Of course, this process is likely because I requested a generalized reading. If you have a specific question or choose a particular layout from her website, I'm sure the reading will follow that format. After the interpretation of the cards, Brenna let me know that she used eleven different stones alongside my reading and that my energy had a "lovely peachy glow." She offered to draw a few clarification cards for me free of charge if I had any questions. When diviners ask for a review, I always request a general reading to gauge accuracy. When Brenna offered the review, I was in a strange place. I had just left my coven and started therapy. I was in a place of change and flux. Brenna's reading reflected that, with her final card - the main focus of the reading - being The Hierophant. Upright, this is a card of tradition. Reversed, The Hierophant is all about breaking tradition and, in Brenna's words, "challenging the status quo" by making my own decisions. For seven years, I had been a part of a coven and lived with my trauma. I was challenging that aspect of my life. The reading itself reflected various aspects of that. Brenna drew the Two of Cups first. She described this card as the couple's card, indicating an important relationship with someone that always has my back. This would certainly indicate my husband, who has been by my side through thick and thin. The second card, the Five of Swords, a card of loss and consequences. Again, Brenna brought up that the status quo is no longer right for me. She's right: I don't like conflict, but it's time to cut my losses and move on. That I did. It's the third card in this set that currently a bit baffling: The Six of Coins. In this, Brenna said that it was time for me to reap the rewards of my kindness. "The Universe has seen your willingness to give so in turn, know that you shall receive." Though we are now three months out from the reading, I have yet to see this card manifest. Perhaps it's still coming! A side note that peach auras tend to indicate people who are compassionate and self-sacrificing. I'm not necessarily commenting on that either way as I'm not the best person to evaluate my own qualities. I simply thought it was interesting. Overall, I felt that Brenna's reading was on-point! I was impressed by the accuracy and am hopeful that that third card will manifest soon. I also appreciated her openness and professionalism and would certainly recommend her to anyone looking for a short, to-the-point e-mail reading. In terms of price, Cosmic Tempest Tarot is incredibly affordable. Readings range from $15 to $35, and Brenna offers a free, no-obligation consultation through her Facebook page. This consultation covers your problems, a plan of action and even a few tarot card pulls! If you're looking for a tarot reading for the upcoming year or have a friend or family memer on your holiday gift list craving one, check out Cosmic Tempest Tarot.